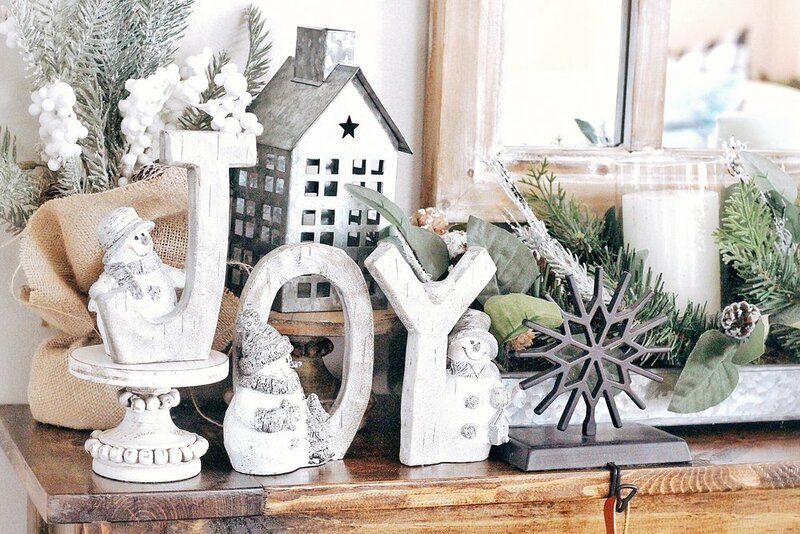 Deep down, everybody loves the idea of a merry little mantel for the holiday season. There’s something so appealing about cozying up by a fire with stockings hanging, a Christmas sign counting down the days and garland giving off festive feelings. Don’t have a picturesque fireplace with a traditional mantel? No problem! You can make do with what you do have in your home. 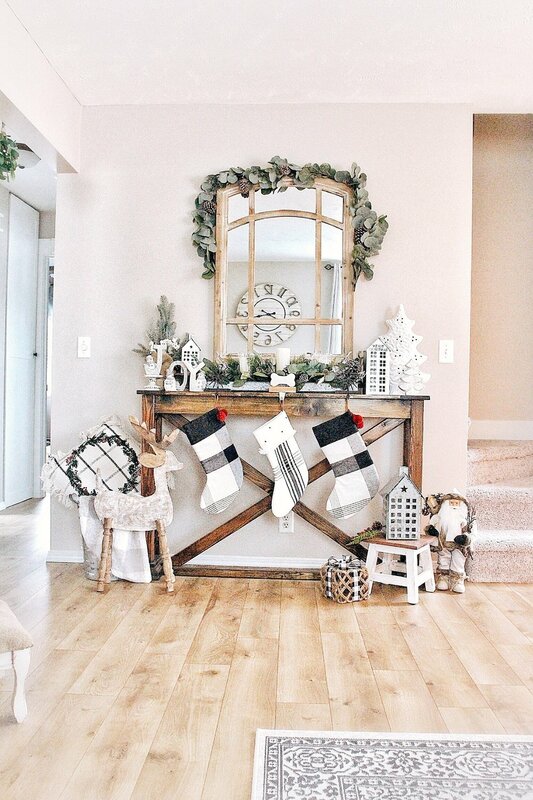 Kristen from Farmhouse Flare Designs has an awesome way to make your own mantel in a starter home or small space. Hi y'all!! It's been so hard to get on here lately with the busy fall we had, but this winter I'm going to have much more time with being cooped up inside. Winter is sometimes a harsh season, but I just love seeing the sparkly white snow. Speaking of that pretty snow, I decided to spice up our Christmas tree this year and went with a flocked 7.5-foot tree. Let me tell you folks, it is just so darn pretty and I love the look of real snow that this tree has. Saving the specifics for another time, I'm excited to show you guys another space I decorated this season! Since we don't have a fire place in this little old starter home of ours, we have to "make due" with our cute little table that AJ and I built. This table will always be with us since it was our first, and ironically enough it's been a favorite on the page. I always treat this table as my mantel, and design it with that in mind. Kirkland's is one of my favorite home decor stores out there, and sometimes I can't believe that I'm getting to work with them again. The thing about Kirkland's decor, is that I can always count on the quality. I really truly believe that too! I will always tell you guys the truth, and I stand behind their quality. I was so excited to receive the items from Kirkland's, and honestly didn't even have a complete idea for my "mantel" decor. As soon as I pulled out the items, I tossed a few ideas back and forth, then about an hour later it all came to me. To tell you the truth, there are times when I have these blank moments and have what I call, Decorator's Block. When it comes to Christmas, I just have too many different ideas I can't fit them all into our home. Let's just say, I received the items Friday afternoon, and by Saturday afternoon I had the Christmas tunes going and was ready! I would have started in the morning, but Lord knows I was out for the count with a bad cold. I'm going to include the list of items that I received from Kirkland's for this style, and include the links to each here. That way you can head on over and get those perfect Christmas decorations! SO...here's what my crazy decor mind came up with for my first look of my mantel decor! I know a lot of people say this, but in my mind the pictures don't even do this little beauty justice! I was just so incredibly happy with how everything fit together, and even more importantly how the pieces from Kirkland's pop! I'm a eucalyptus lover, so their centerpiece just fit perfect on our table. One of the best things about it was that it was the perfect size for mantel decorating.. I was able to put it on our table and still fit the stocking hangers in front of it. I will be using this little beauty all winter for sure! Their pillow I received is made of great material, and I loved the addition of the wreath on top of the skinny plaid. I'll have to be sure to keep this one away from the couch so AJ doesn't turn it into a sleeping couch pillow (lol). It's so adorable and a pretty ivory color. Lastly, I added the little JOY snowmen. They are just darling!! I was so obsessed with them when I first saw them, and again they are something that I can use beyond Christmas. I tend to get this from my mother, but I love having Christmas decor that I can also incorporate into winter decor so I can use it longer. Now while I only needed those three key items to bring this “mantel” together, I wouldn't even stop at the decor I've showed y'all today! Kirkland's Christmas decor this year is just so beautiful and makes me want to buy the whole store. It doesn't help that I live about five minutes away from our local Kirkland's either. I think if I could decorate my whole house with Kirkland's I definitely would. My dream is when we are in a bigger home one day that I can buy some of their bigger beautiful signs to hang in a dining room or entryway. But I'll save that for when we cross that bridge! If you haven't had the chance to, go take a peak at your local Kirkland's store and find some of your Christmas favorites. If you don't have one close, their online deals are pretty amazing! And their photos online really do showcase the true product you are receiving. 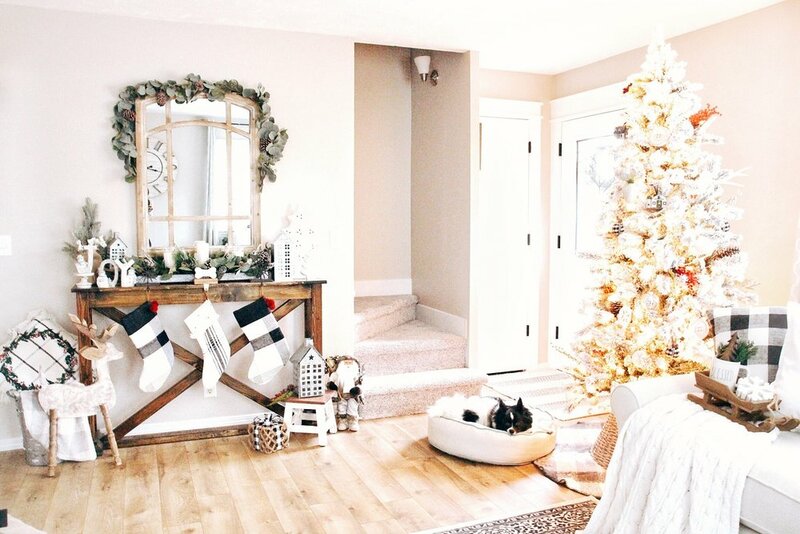 Thank you all for taking the time to see this year's Christmas decor in this little starter home of ours, and I hope it helps inspire your own festive decor and I can't wait to show you some other variations I plan! Looking for more inspiration to try around your home? Be sure to check out Kristen’s blog for tons of tips, tricks and hacks, and, as always, keep checking back here for more ways to live life Half Full. We’re here with four things to consider before you mix and match pillows. Let us guide you to a look you love.